Houla, bordel fait chier merde putain j’ai les boules !!!!! Mes super parents m’ont viré le modem et le clavier, mais j’en ai trouvé et donc je peux qd meme me connecter en “fraude” mais c’est très chaud et pas souvent !! Enric Alvarez was organizational psychologist in the real life when he made these maps for Quake 2 in 1998. He was also the webmaster of the LPQ2, the Professional Q2 league in Spain. Diseñador de niveles para Duke Nukem 3D, Quake, Quake2, Unreal y lo que venga. Today we are going inside the Quake movie director's studio to re-visit the films of Leo Lucien-Bay, aka Dr. Nemesis, one of the first prominent black machinima directors. Join us, thru the time traveling power of the Internet Archive, as we revisit the lost Quake movies of Dr. Nemesis. The team at LAMERKATZ has put together their own demo: LamerKatz Chronicles. This demo has to be the funniest demo that I've ever seen. It's not often that you watch a demo of people getting fragged left and right, and the people getting fragged are the demo makers. And it's set to some pretty cool tunes, done up like a couple of rock videos. Quake 4 Oldies is a Clan that aims to perform gaming in a relaxing way. No frustrated teenagers but enthusiastic gamers. Of course it is in us to want to win, but ejh, at our age we want to have fun with each other, and do not want to cost what it costs to win. 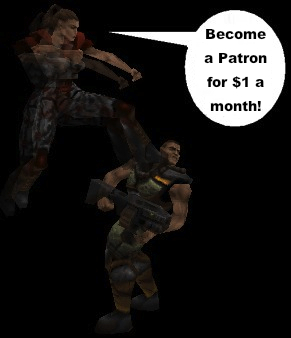 Quake 4 Oldies stands for "Fun".